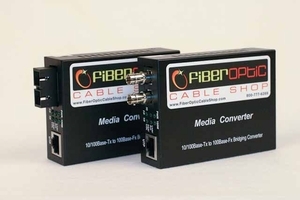 The ME-1420-MM media converter transfers data over duplex fiber at 100Mbps (at 850nm) and connects to copper Ethernet at 10 or 100 Mbps while auto-sensing the correct speed. Maximum distance for this unit is 550 meters (1800 feet) when using 50/125 multimode fiber and 220 meters (720 feet) when using 62.5/125 multimode fiber. Distance on the Ethernet side is 100 meters (328 feet) using Cat-5 or better (unshielded or shielded twisted pair) copper cable. The fiber connections are SC or ST and the copper Ethernet connection is RJ-45. A version with an FC fiber connector is available on special order. Please Note-- Price is for each unit. Normally two are required. Power: 5vdc at 2.5 watts. Power supply included operates at 110-260vac at 50-60Hz. Flow control: IEEE802.3x flow control for full-duplex mode, back-pressure flow control for half-duplex mode.